My friend, Mirjam, asked if I could make something for her living room with a bit of leftover curtain fabric she had. “A bit” turned out to be at least six metres worth, so I had options. I think there was enough to make an entire new set of curtains, but I’m pretty sure that’s not what she had in mind. A year or two ago I went through a pouf phase and I still had enough styrofoam microballs in my upstairs storage for one more. 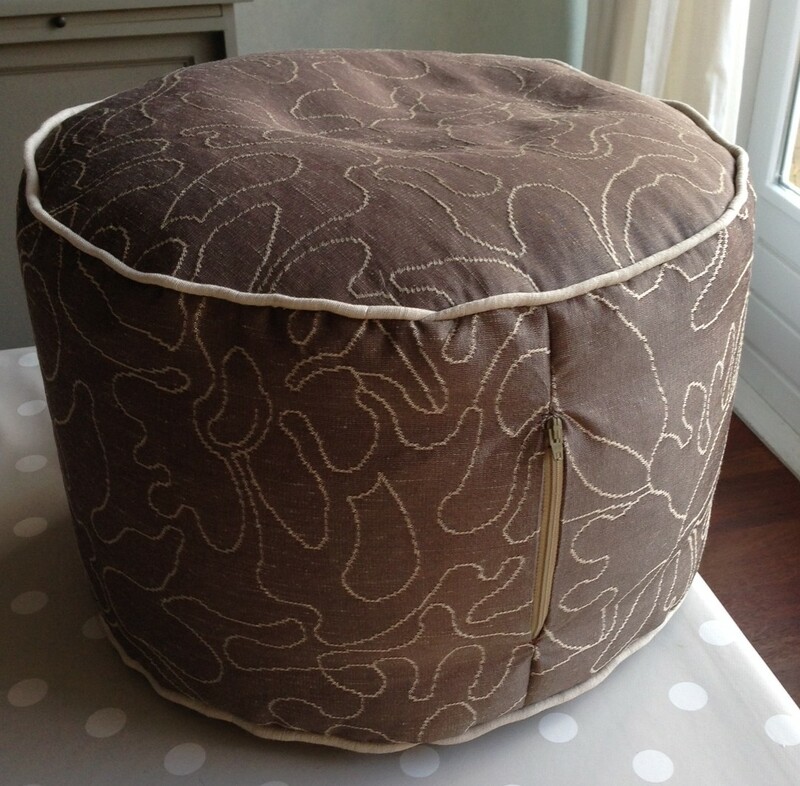 I originally used this tutorial to make poufs. The directions are clear and I like the dimensions. For this version, I made a handle and piping out of some beige linen curtain remnants that perfectly matched the design in the main fabric. 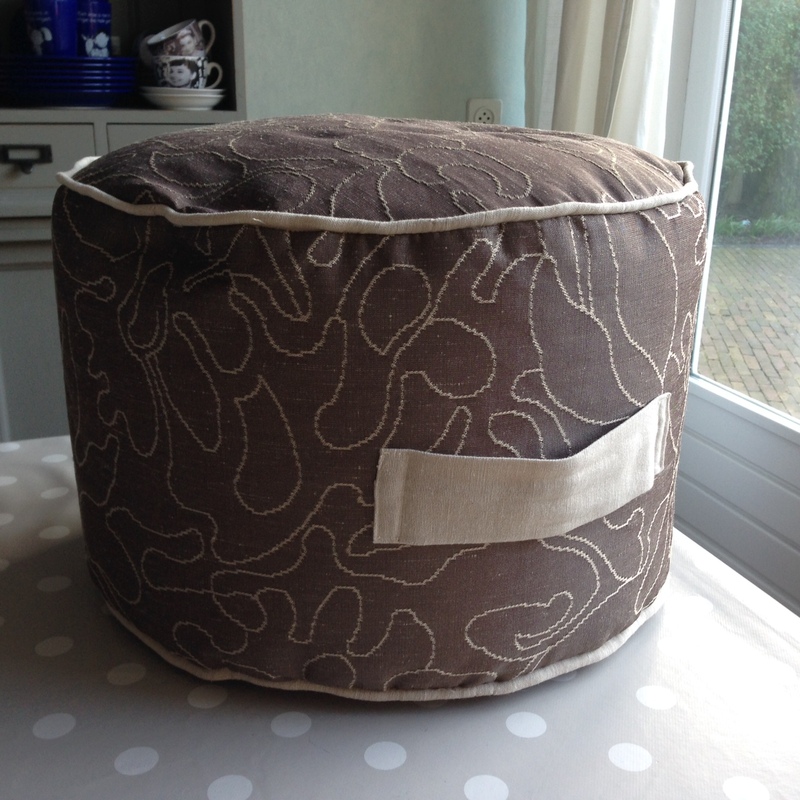 I’ve discovered that after much use the styrofoam balls begin to compress, requiring a periodic pouf refilling, Adding a zipper to the pouf makes refilling a breeze. To discourage styrofoam ball explosions, I secure the zipper shut with a few stitches by hand. I have learned this the hard way. 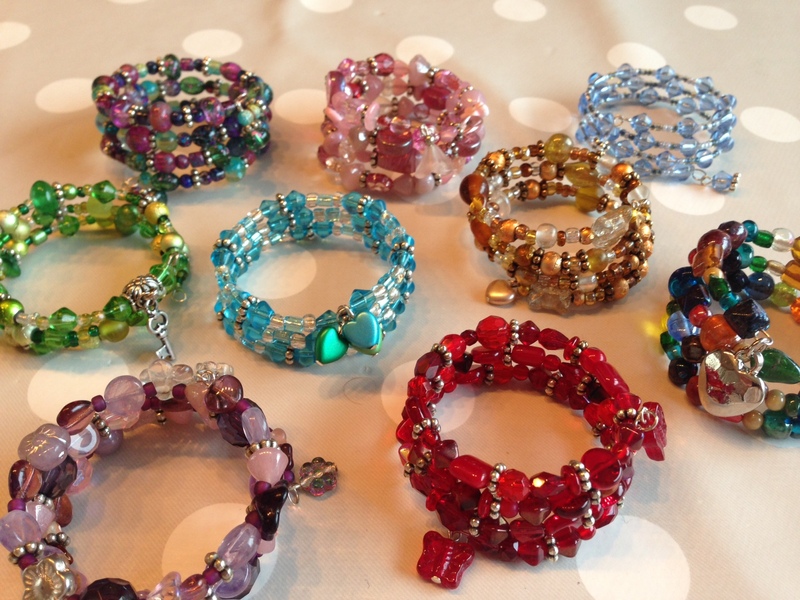 In the spirit of the 365 project I’m trying to spend nothing on beading this year. I found a package of child-size bracelet wire wrap (to make bracelets shaped like Slinkies, that you wrap on). I bought this by mistake years ago and never planned to use it. Plans change. I snipped a section of three or four full rounds and twisted a small loop on one end to keep the beads from falling off. I have boxes (and boxes) of glass beads in random shapes, sizes and colours. 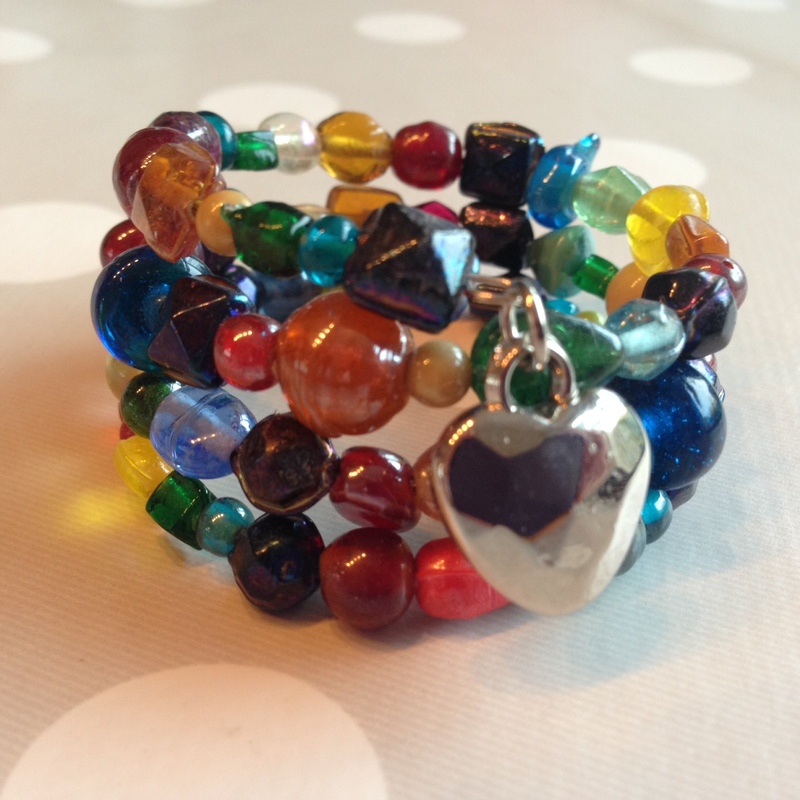 I sorted by colour and strung the beads in a rainbow pattern, and attached a heart charm to the end loop. Cute, no? And if one is cute, nine must be cuter. I may have gotten a little carried away. I’m all out of wire now. If I ever host a party for a bunch of preschool girls I’m prepared. 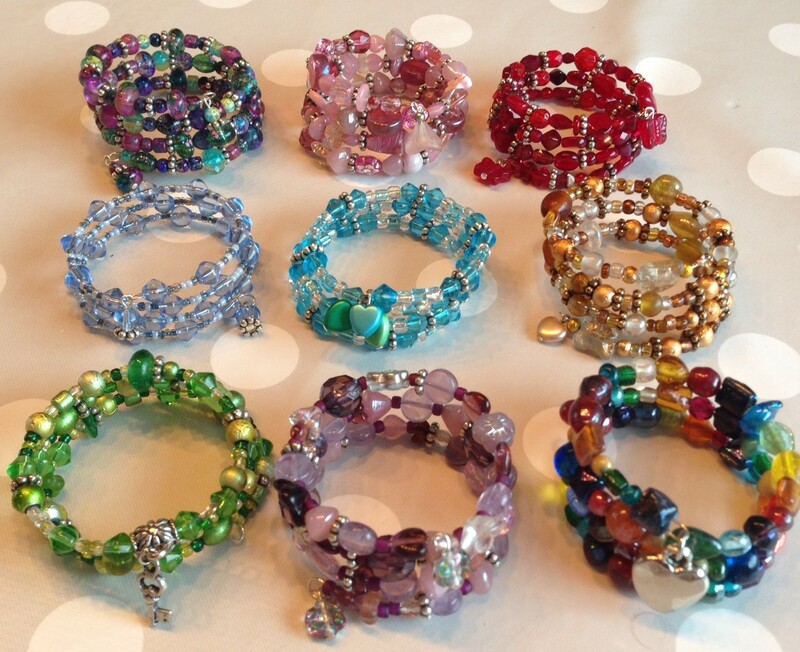 We can play Oprah: You get a bracelet! Everybody gets a bracelet! The Great Toque Marathon started with a simple dinner out. 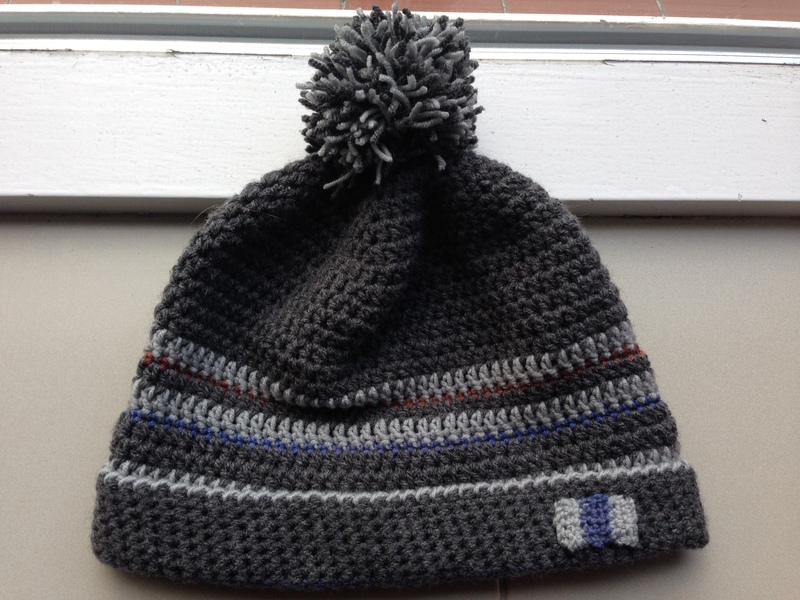 I had plans to meet some friends downtown, and as it was cold (January) and as I was taking my bike, I needed something to keep my head warm. 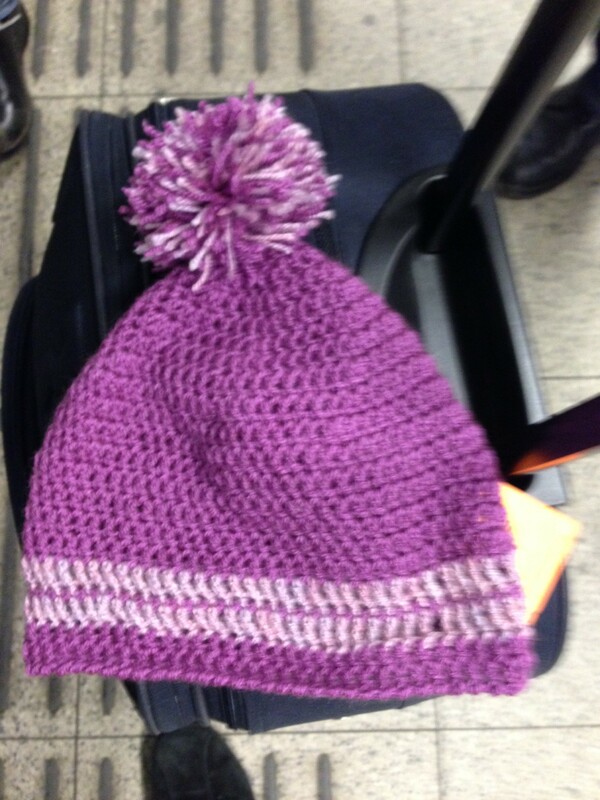 But not one of last year’s toques matched this year’s winter coat. So that morning I dug through my yarn basket and pulled out everything that would work with a brown coat. 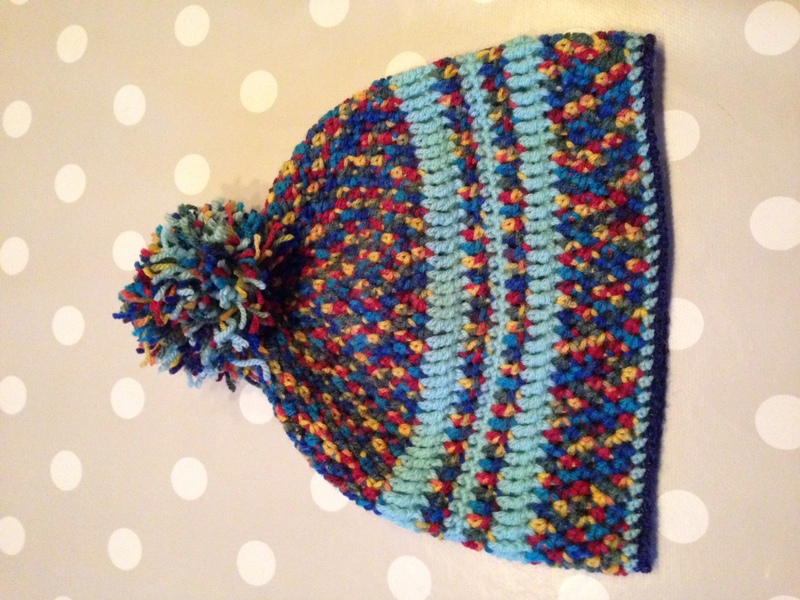 Then, using a 5mm hook, I started crocheting random stripes. 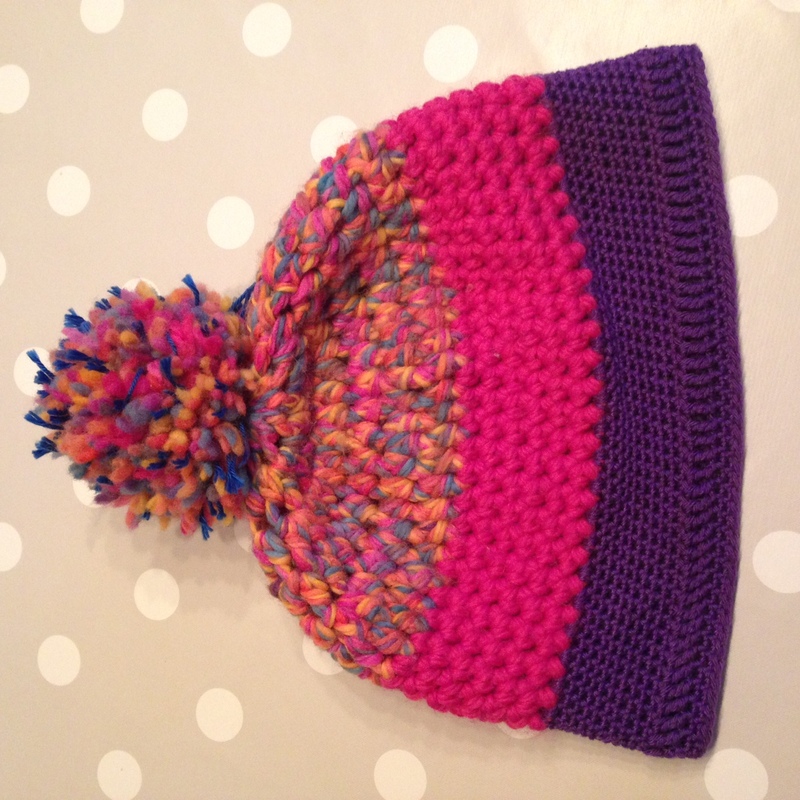 I finished with a row of crab stitch, and made a finger pompom to top it off. Done! Or so I thought. 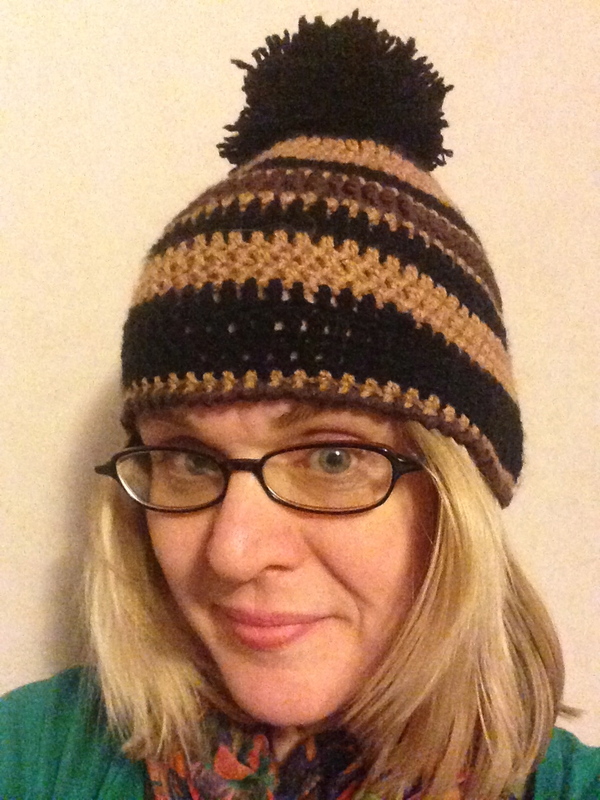 Who knew that so many friends would want a a toque? Pardon the blurry train station photo. 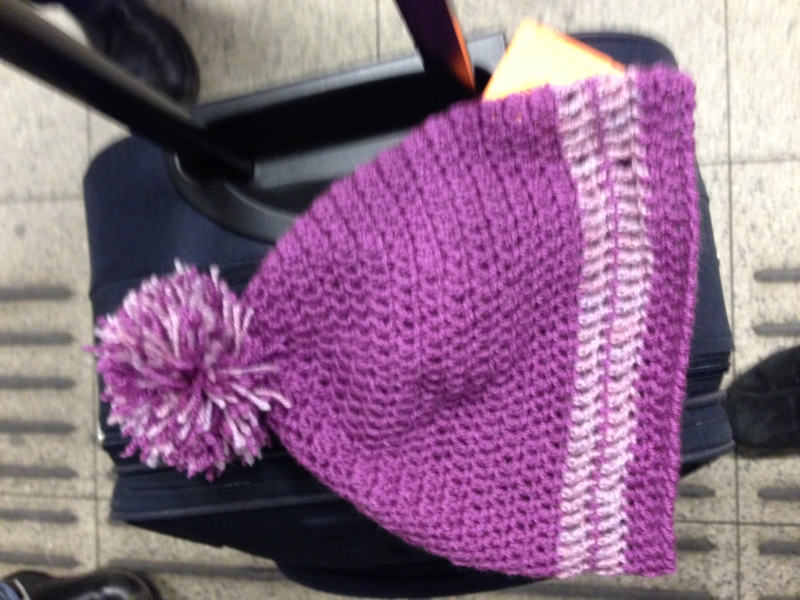 I finished the hat as our plane landed back in Amsterdam, and forgot to take a photo until we were just about to board different trains home. 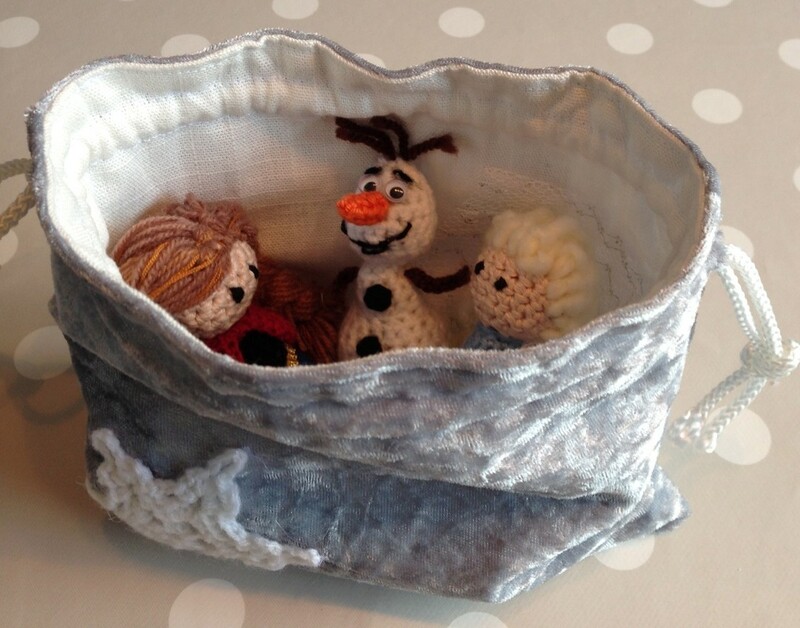 Yesterday’s Frozen team needed a home, a soft place to call their own. And since I’m over budget, it had to be free. 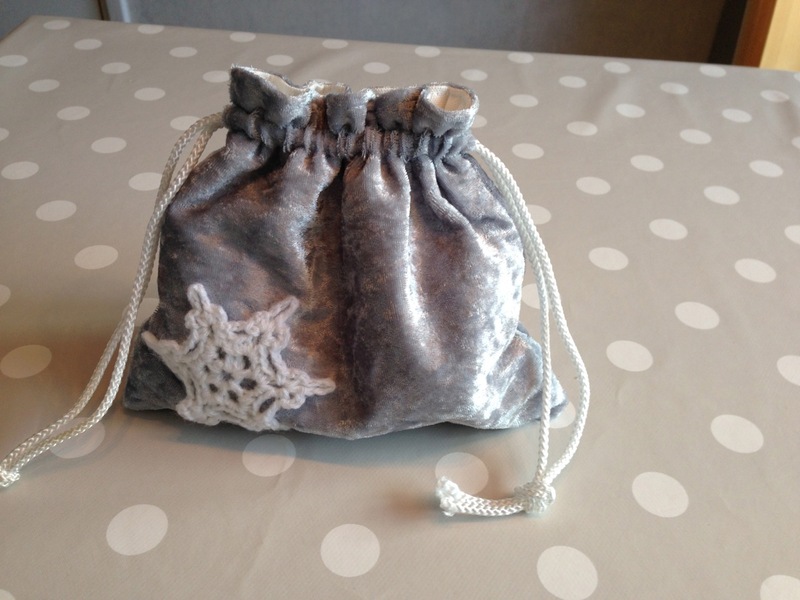 I decided on a drawstring bag, made with some silver stretch velvet from my stash and lined with white cotton (Ikea curtains again). 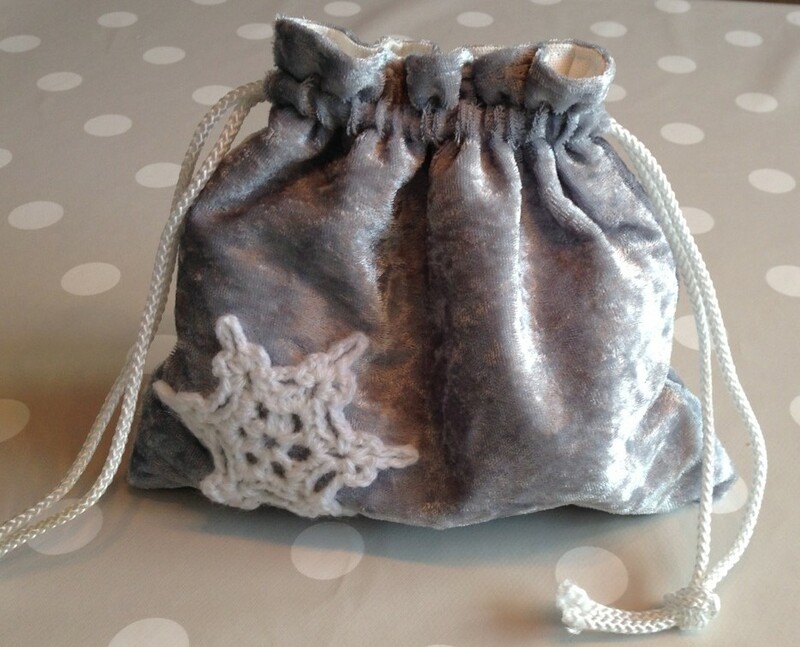 I found the snowflake in the bottom of my yarn basket and hot-glued it to the bag. This snowflake deserves a special mention in The Beginning of all Things. The only reason I wanted to learn crochet was to make snowflake ornaments for my Christmas tree. 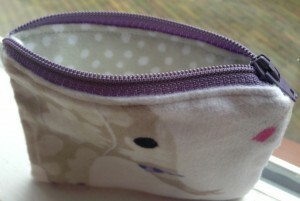 My friend, Rochelle, who taught me, used this tutorial by Lucy at Attic24. So does the team like it? Looks cozy to me. 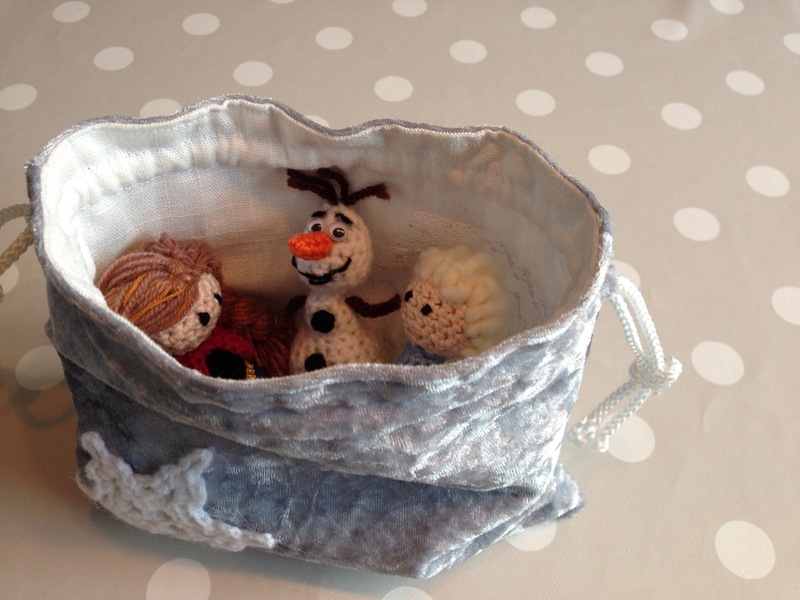 Have you seen Frozen yet? What a beautiful movie! It’s my favourite Disney film in a long time. And I even still love the soundtrack, despite having heard it no less than 300 times in the last month. My oldest daughter has learned “Let it go” in English, Dutch and French, and is now working on the Spanish version. And have you seen the youtube sensation: Maddie and Zoe sing, “Let it go”? The cuteness, oh, the cuteness. 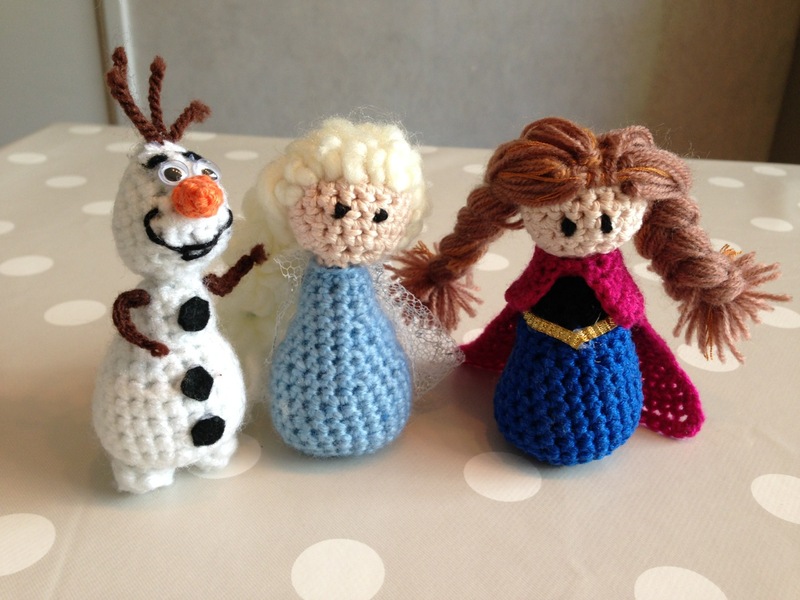 My younger daughter needed a birthday gift for her friend, and as they share an affinity for all things Frozen, I started googling patterns. With my project budget, I was aiming for free. And I found it! 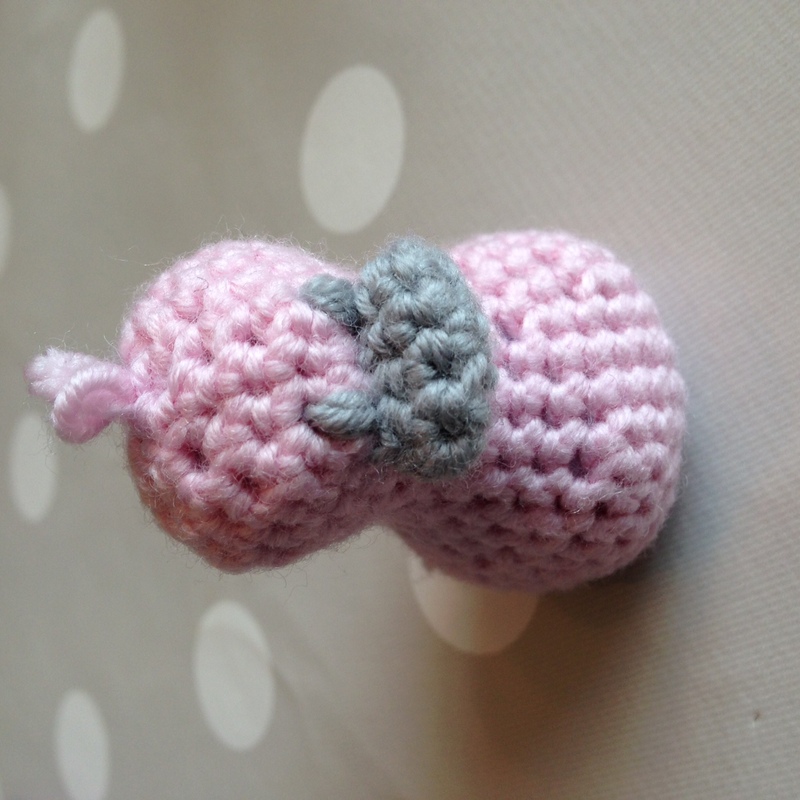 It’s a French blog, but if you speak crochet it’s pretty easy to figure out. 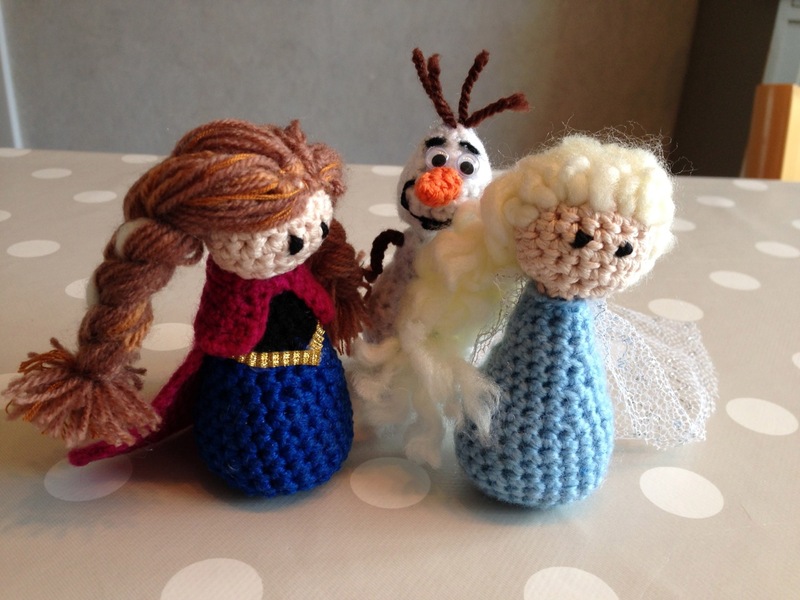 She has patterns for Olaf and Elsa, and it wasn’t hard to adapt the Elsa pattern to Anna for a complete set. 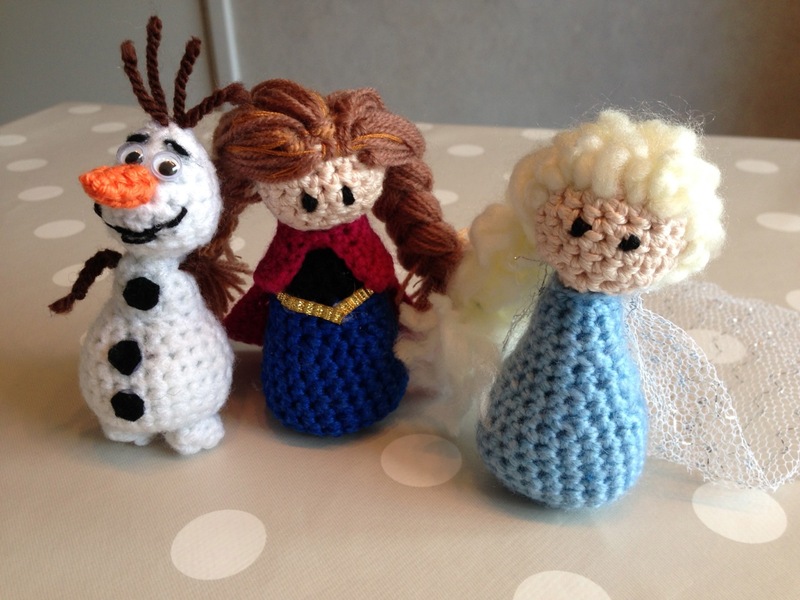 I used a 3.5mm hook for everything except Olaf’s carrot nose. I crocheted Elsa’s dress with light blue acrylic. 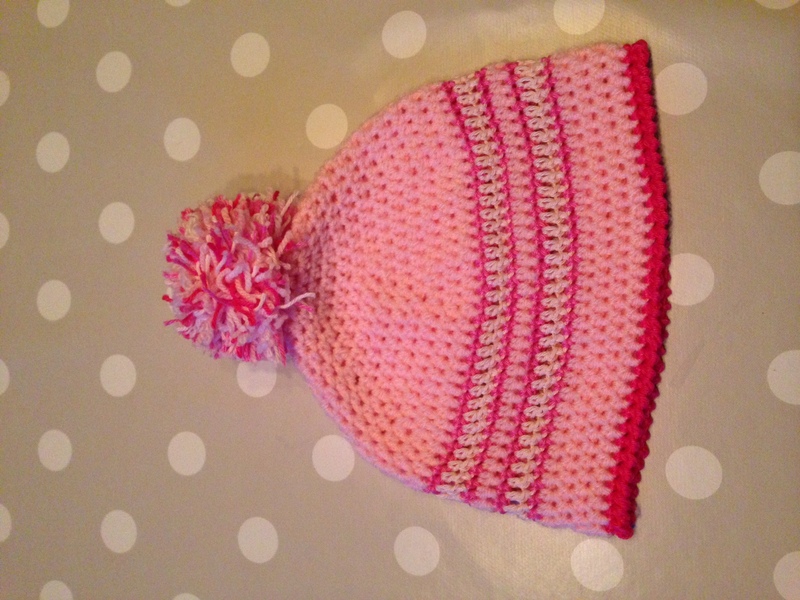 Her head is Catania cotton — the only yarn I could find in Scandinavian Princess skin colour. Because it’s a much thinner yarn, I crocheted double strands to make the same proportions as the body. 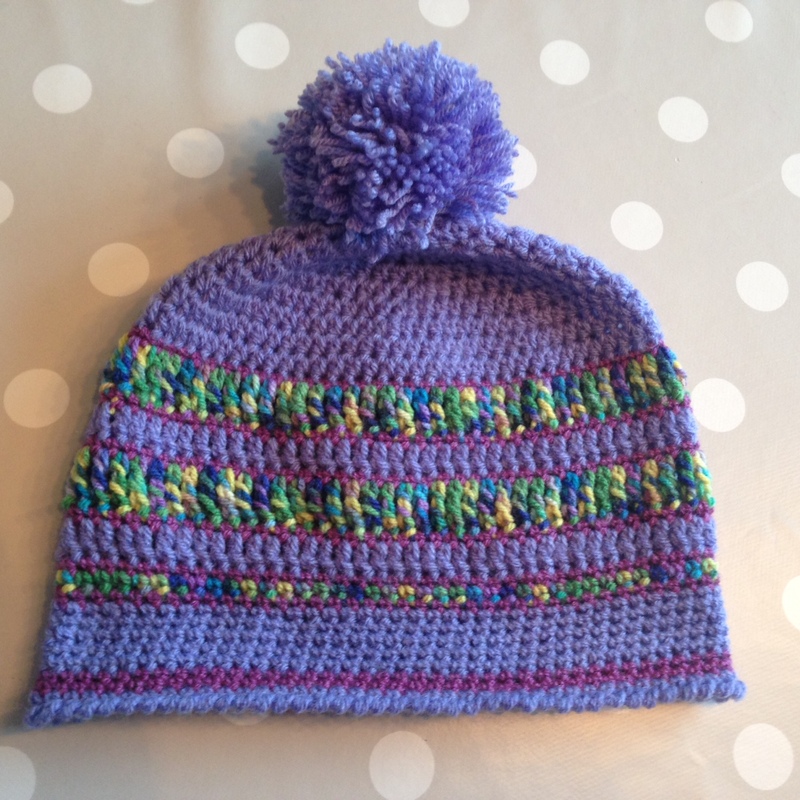 This was tough to crochet! The base of my thumb was warm from the inflammation and it still hurts, several days later. 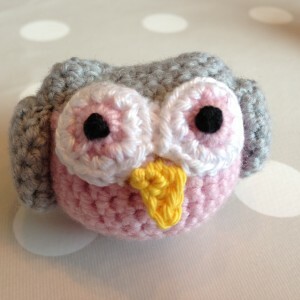 I’m going to need to lay off the amigurumi for a few weeks or until the pain goes away. 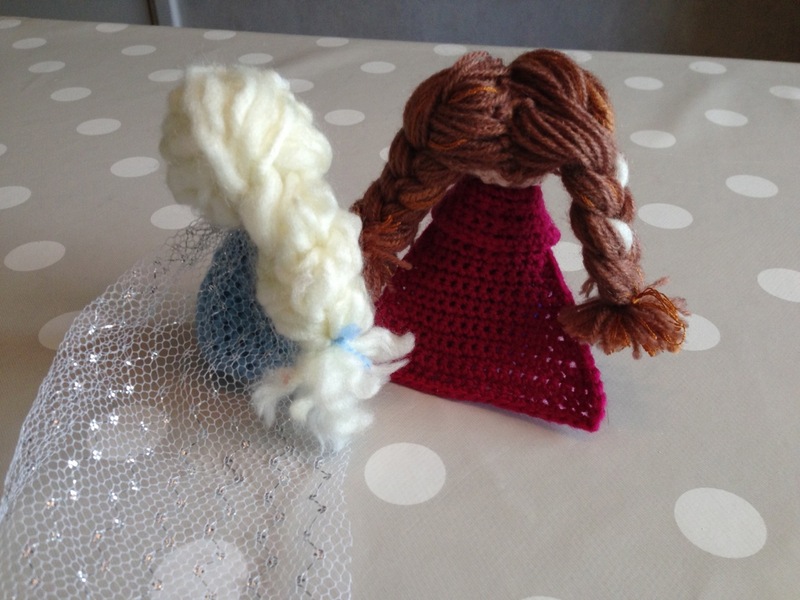 Elsa’s hair is from a tiny remnant of thick soft wool leftover from last winter. I pulled apart the strands and it immediately fluffed out. I braided it in a 2-strand braid off to one side, and stitched it down to make it stick to her body instead of springing from her head Pippi-style. I saved one strand for Anna’s streak. Elsa’s cloak is a scrap of sparkly tulle from my stash. I embroidered eyes with a scrap of black cotton yarn. Anna’s skirt is dark blue Catania cotton, also double strands, and I switched to black acrylic a few rows from the top for the bodice. She has the same painful head as Elsa. Her hair is medium brown acrylic, along with a few strands of a random scrap of thicker brown yarn and some embroidery floss to give a “real” look to the hair colour. I don’t think I’d bother with that next time. I added a single strand of Elsa’s hair wool for the streak. A scrap of gold ribbon hot-glued around her waist finished her off her body, and I crocheted a cloak out of wine-coloured acrylic (improvised a pattern). Like Elsa, she has black embroidered eyes. 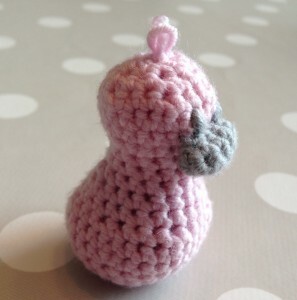 With the last of the grey and pink yarn from the baby set, I made a little friend for the duck. 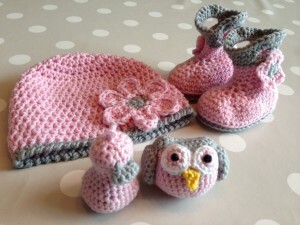 The pattern is another winner from Repeat Crafter Me. Love that blog! 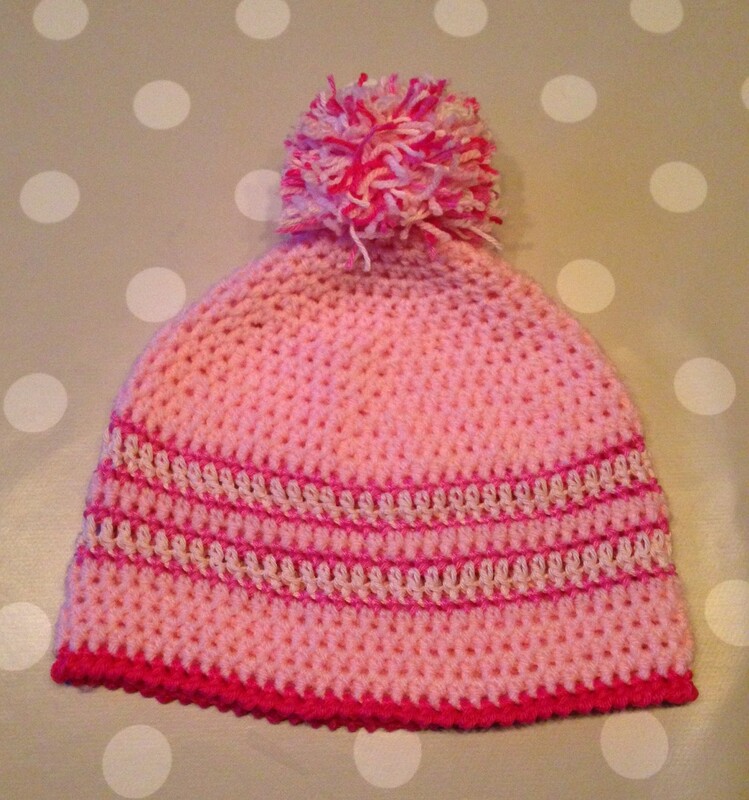 With just 15 centimetres of pink yarn left I think we’re done. 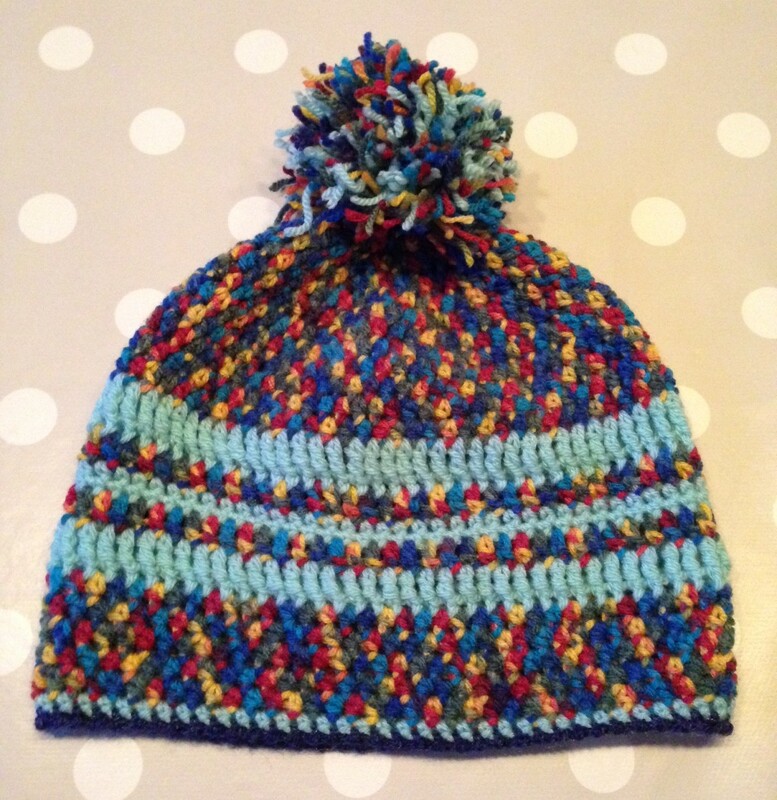 My friend, Rochelle, who first taught me to crochet in Paris three years ago (yeah, we really party in Paris — old ladies with our hooks and yarn), sent me a link to this free pattern. Lots of other ideas there, too! 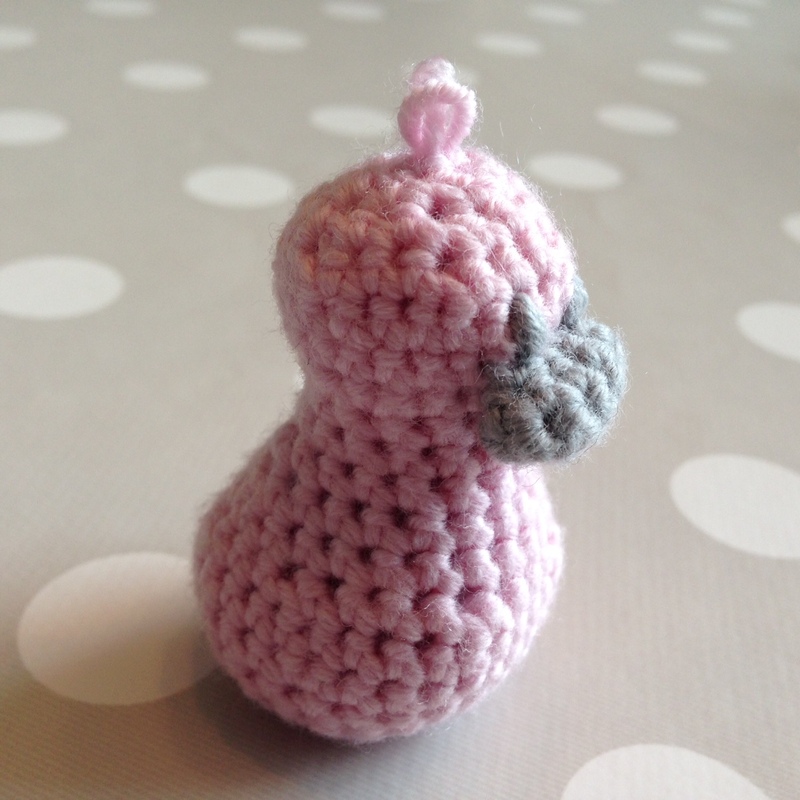 I crocheted with a 2.5mm hook for tight, no-stuffing-falling-out stitches. I might need to make more of these! They’re quick to make–about an hour and a half–and they take almost no yarn to make. I’ve learned over the years that one way to reduce panic and stress in my life is by having a gift stash. Yesterday’s post was a case in point: last minute teacher gifts pulled from my growing 365 Stash. So while I don’t have an immediate recipient for today’s project, I’m sure it will eventually be just what I am looking for. Today’s project? A baby hat and booties, soft and sweet, for some as-yet-unborn baby girl. A half-skein of lovely grey Lana Grossa super soft merino languished in the bottom of my yarn basket. I picked up some soft pink in the same line from my yarn lady, and got to work. A long time ago I found a flower pattern in the free pattern directory at Crochetville.com and since then I’ve made dozens as appliqués. I can’t find it at their website anymore, and the address at the bottom of my printout is no longer valid. Good thing I printed it out. 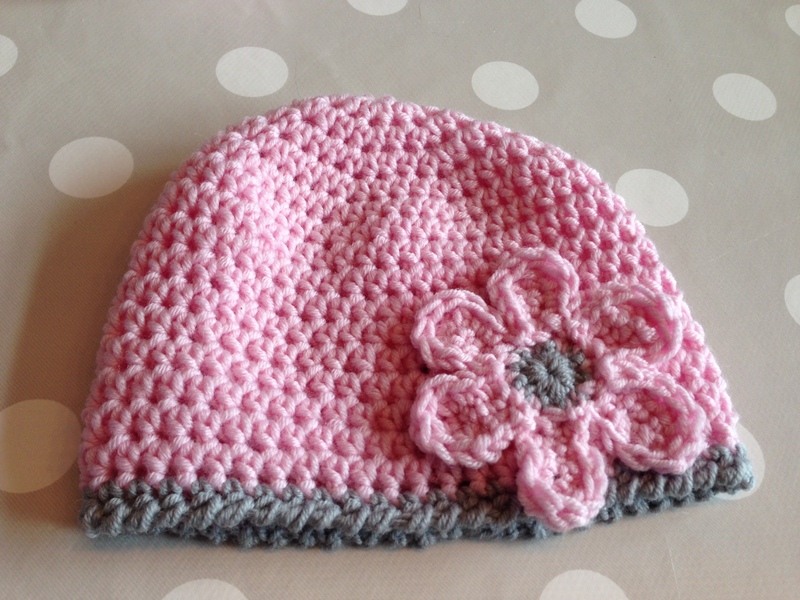 Using that pattern, I crocheted a pink flower with a grey centre. 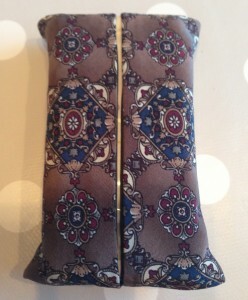 A perfect girly embellishment! 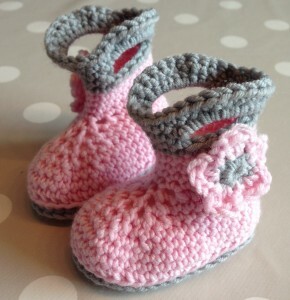 For the booties I went to Repeat Crafter Me. This blog is a treasure trove of awesomeness. 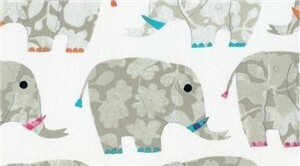 So many patterns! I could spend my entire 365 project here. But this time I was just looking for booties. 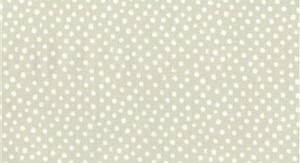 I found what I was looking for at the bottom of this rain boots pattern. 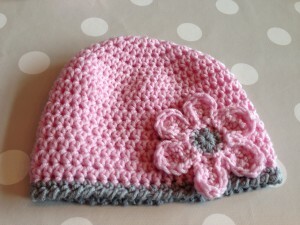 See the pink and grey version, with the sweet little flower? That was my inspiration. 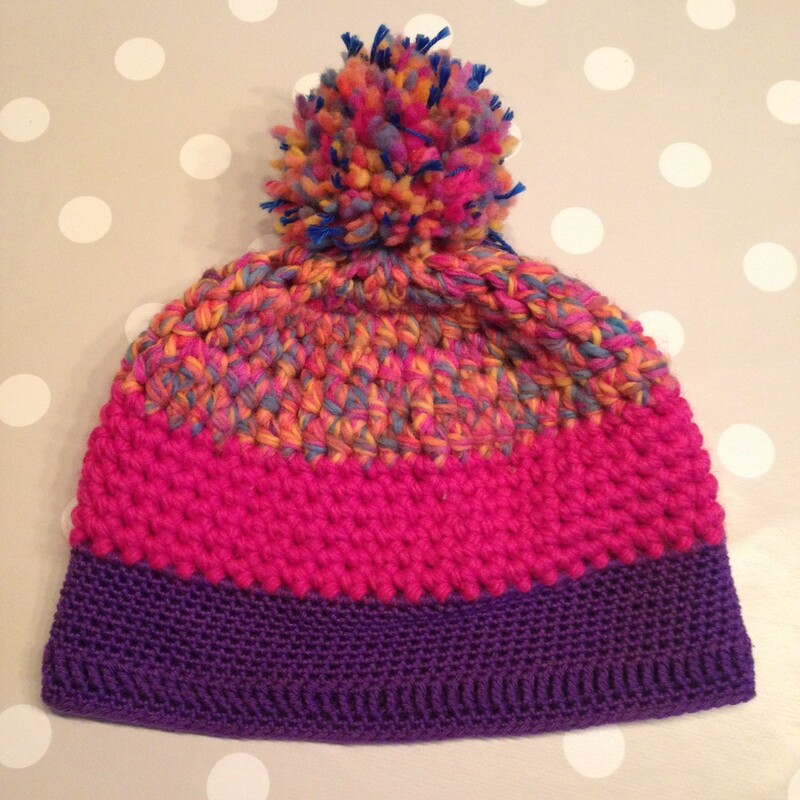 My first go was a failure – I got lost in some of the instructions – but Round 2 was a hit. I crocheted two basic 5-petal flowers for the finishing touch. My wrists and elbows thanked me for this project. 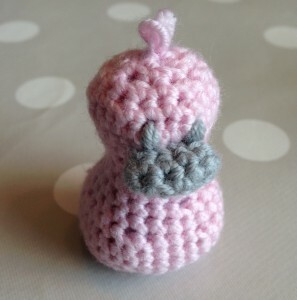 I usually crochet amigurumis, where tighter is better. 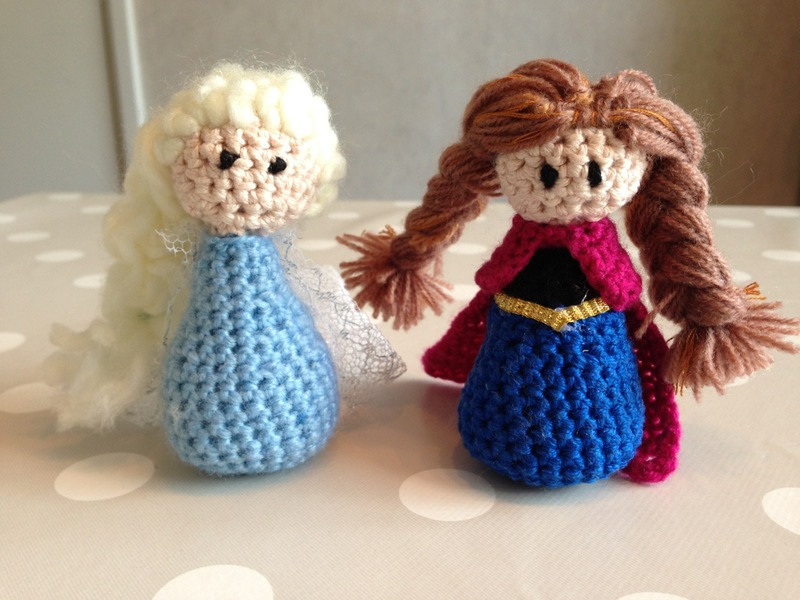 My hands are still sore from crocheting Elsa and Anna dolls yesterday — more on that next week. 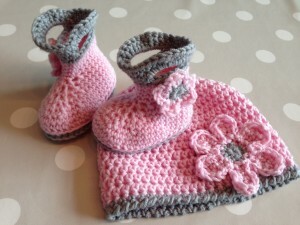 This hat and booties set, crocheted gently with a larger hook, were downright soothing to make. Got the sniffles? Plus some random scraps of fabric? This thing’s for you. The internet is full of marvelous tutorials, but I picked this one at So Sew Something. 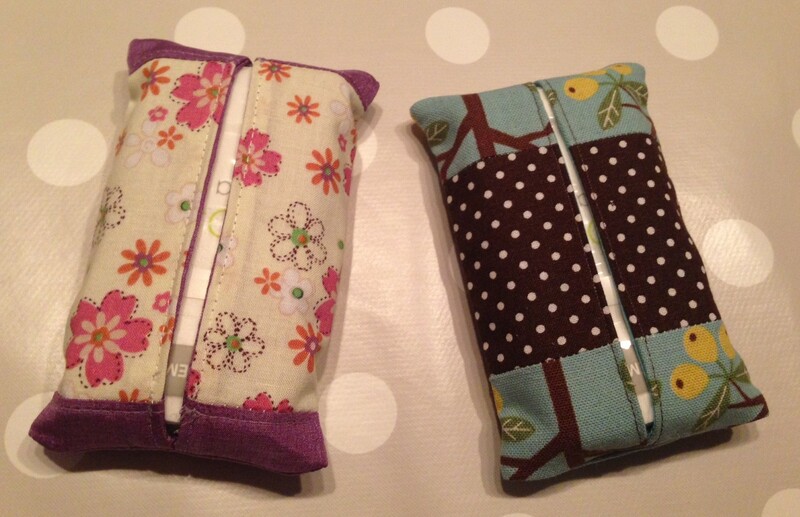 The directions were foolproof and the sizing worked out great for my little Hema tissue packs. I can run these up in about 10 minutes if I’m just using two scraps of 6″x7″ fabric. 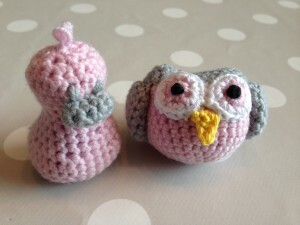 The first two I made, though, have some minor patchwork involved, so they took a bit longer. 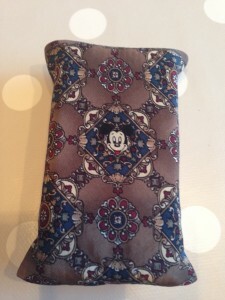 The third pouch is made from a silk Mickey Mouse tie I bought for my husband way back in 1996, when we were young and in love at Disneyland. 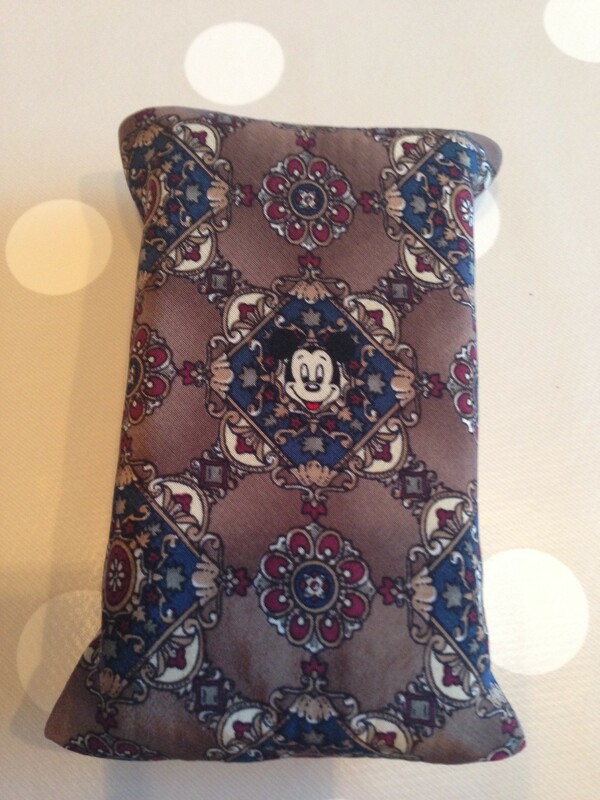 He wore it a few times in the late 90’s to be polite, but since then poor Mickey has languished in tie purgatory. It was time for a rebirth. Aargh! 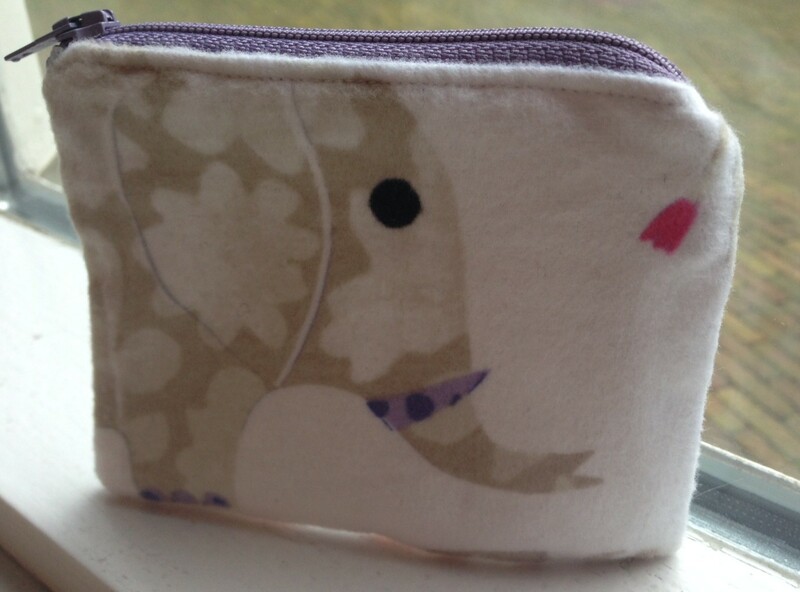 I spend so much time cutting it so carefully, only to have the front bottom mysteriously veer off pattern. 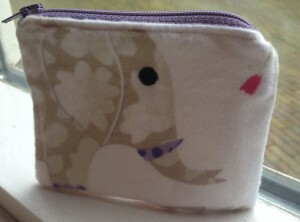 There was just enough to make a wee little zipper pouch. This tutorial is so clear and easy, with step-by-step photos. 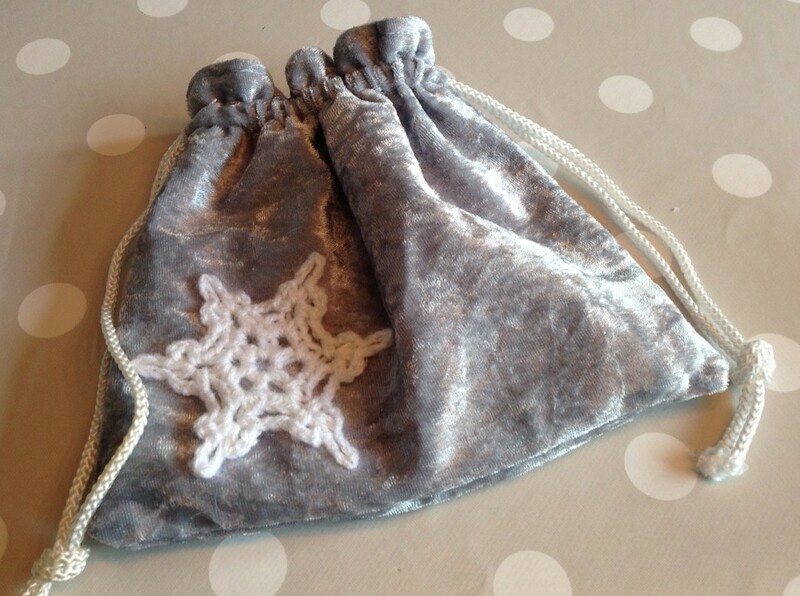 I used it to make a stack of pouches at Christmas. I’m still working on inserting zippers neatly, especially at the ends. My stash is full of scraps and random zippers (I harvest worn out clothes for buttons and zips), so I anticipate plenty of pouch practice this year.